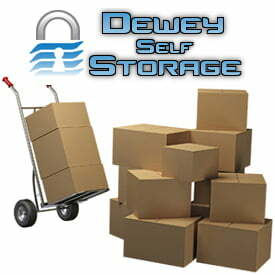 Dewey Self Storage - We Make Storage Easy! Welcome to Dewey Self Storage where storing your belongings is made easy! Our indoor facility has over 100,000 square feet of storage capacity. Outdoor storage is available as well. We focus on providing our customers a properly secured and maintained indoor and outdoor storage solution. In business for over 21 years, you can count on Dewey Self Storage to keep your things stored safely and securely at cost effective pricing. Securely store your items with us with confidence! Store your personal property, car, boat, rv and everything else! Clean and climate controlled 100,000 sq ft facility! Property surveillance with closed-circuit television! "I must say that Dewey Self Storage is a very clean and safe facility. I slept well knowing my belongings were stored safely..."
"The staff was very courteous, the units were clean and the pricing was very competitive!" "I've been keeping my vehicles and boats there for over 10 years now and never ever had 1 problem. Thank you!" "The owner has been a personal friend of mine for 20+ years and he is always looking after my belongings!" "I'm a business owner and keep a large amount of my inventory at Dewey Self Storage. Never had 1 issue with them! A+++"
"I stored my car in a barn and mice ate through the wires! I've stored it with you for 5 years now with confidence, thank you!" Signup FREE for our newsletter! You'll occasionally receive updates and discounts! We respect your privacy. We'll never sell or rent your information! Store Cars, Boats, RVs, Etc.